can use herbal coffee grounds, too. Did you know that they’re edible? And that they have a great texture? They do. We should be doing this. 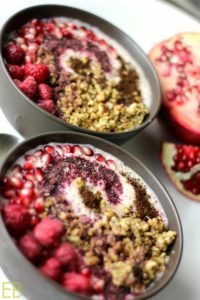 When I asked my boys, ages 12 and 7, what their favorite smoothie bowl bite was and suggested the pomegranate or the raspberry, they both shook their heads, even my son who loves herbal tea. Both of them, their favorite bite? Coffee grounds + granola. And that was my favorite bite too. SO good. Such a cool texture. And the flavor is incredible. Here’s the grain-free granola recipe, btw. It’s perfect. If you aren’t already making this Paleo/GAPS crunchy, crumbly goodness, I need to humbly suggest that you begin. It is FUN food. It is SO good. 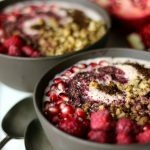 Another exciting topping on this smoothie bowl? Hibiscus! YES, it’s great! You’ll see here how I used it as a donut topping and here how I used it in Raw Energy Balls (cookies). Just like coffee, you don’t have to steep it first to enjoy it’s essence. It’s super fruity and super lemony and super high in Vitamin C as well as lots of other nutrients. 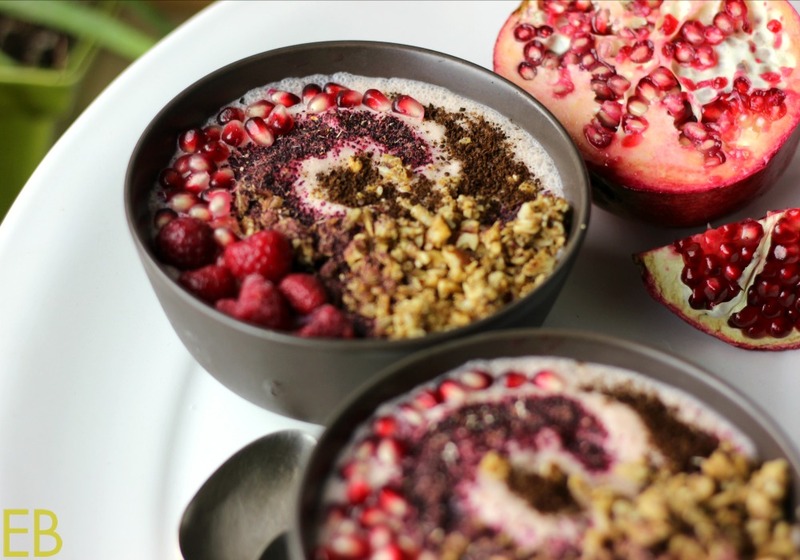 Have some hibiscus on your smoothie bowl by quickly whizzing it in your coffee grinder until it’s powdered. Now you can play with the pretty stuff, making art on top of your smoothie bowl and eating the tart goodness. Pomegranates! Their juicy seeds are used here as the defining topping. They’re the garnet-like smoothie ornament that sparkles and tells us all… it’s fall and soon to be winter! These juicy fruits of now are bright and beautiful against the changing landscape. Fall means: persimmons on their way, red pears, pomegranates, cranberries… Let’s buy these beauties when we see them at the market. It’s that time of year, and don’t you love celebrating the seasons with the changing foods? 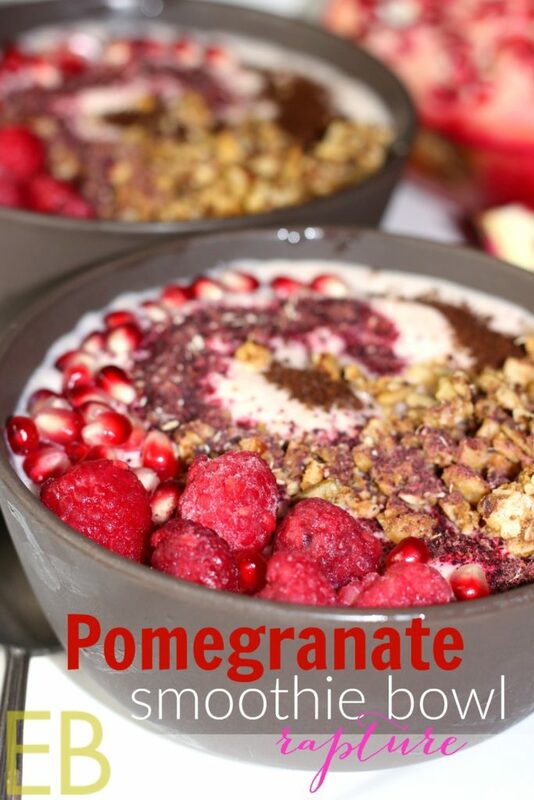 Historically symbols of prosperity, ambition and fertility, pomegranates are high in fiber, Vitamin C and antioxidants. They offer anti-viral properties, great timing for when we’re getting less sunlight and our immune systems are more challenged. Ruby red frozen raspberries are perfect, too, will all the flavors of this bowl, and they’re one of the best fruits to buy frozen. They defrost quickly, and they’re…beautiful. This recipe can be halved to make 1-2 servings. I give some variation below on the quantity of toppings, because that's up to you, how much you want! 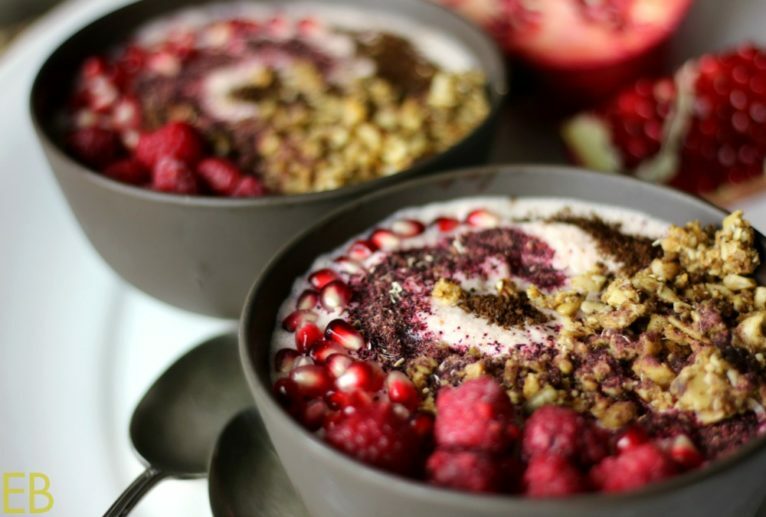 Place the following items in high-powered blender: frozen fruit, milk of choice, optional cocoa or carob powder, honey or other optional sweetener and collagen. Blend on medium speed 30-50 seconds, using tamper as needed to keep the smoothie moving (preventing air bubbles by the blade). 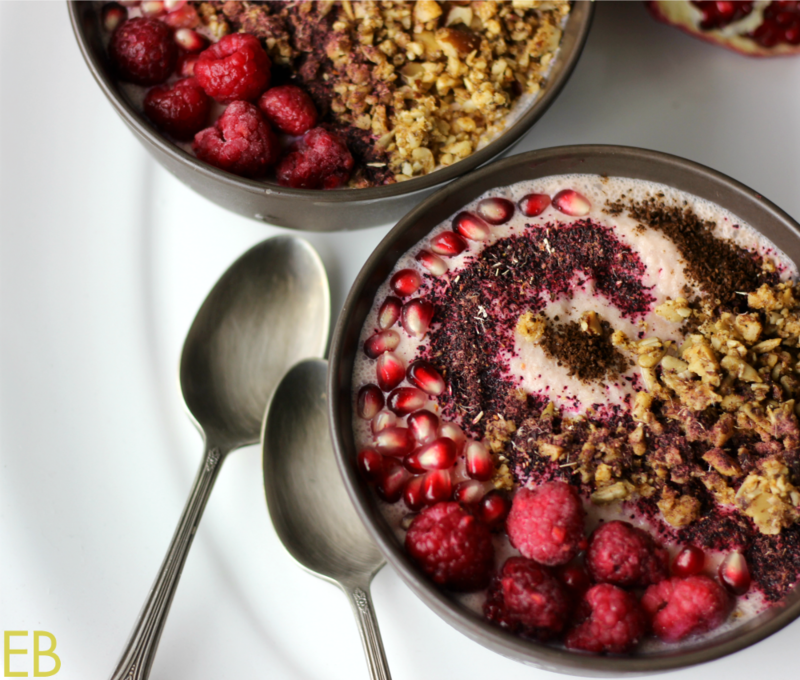 Pour smoothie into pretty bowls and decorate with toppings: pomegranate seeds, coffee grounds, powdered hibiscus, granola and raspberries. Enjoy! Protein Powder~ On the whole, I prefer using collagen as a source of protein in smoothies. But I do like this Pure Paleo Protein Powder that's made from grass-fed beef (you can't taste the beef at all). It's sweetened with stevia, tastes super yummy, and digests well. It can be a good pre or post-workout source of protein if consumed with fat and other needed co-factors, like raw milk. And here's the Paleo/GAPS granola recipe I love best! Ok you might have just made me decide to hop on the smoothie bowl train! You had me at coffee grounds 🙂 This looks lovely Megan! Oh my goodness this sounds amazing! Rapture is the perfect way to describe it! 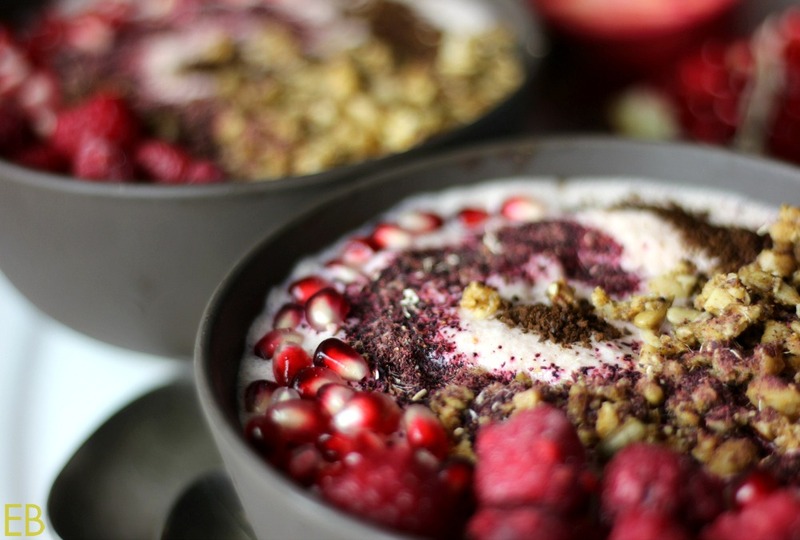 Absolutely beautiful smoothie bowl. This looks so incredibly beautiful! Bet it’s delicious too!! It is indeed. Thank you, Carol! Yes, like this: rapturous. 😉 Thank you, Linda!